he exact origins of Tarot are obscure. 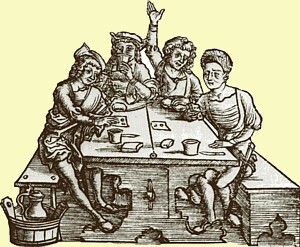 In Europe the earliest records of playing cards in general date from the early to mid fourteenth century (chiefly in the form of bans against their use) with a rash of these edicts dating from around 1370 when their popularity clearly spread in a craze from Italy across Europe, alarming some authorities. Examples and clear descriptions of playing cards survive from about fifty years later, while the strongest references to Tarot as we would recognize it today mainly date from the fifteenth century. But it’s worth remembering that these are just references, the cards themselves and their use in fortune-telling must already have been well-established long before that. Regarding the suits, some of the earliest European playing cards from Germany had Hearts, Leaves, Bells and Acorns as their suits. 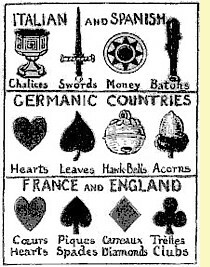 In Italy and Spain they were Cups (Chalices), Swords, Pentacles (Money or Coins) and Wands (Batons) ; while in France in the sixteenth century the Italian suits evolved into Hearts, Spades, Diamonds and Clubs, names which spread to England and then much of the rest of the world. Tarot kept the Italian suits, though how and when the Major Arcana evolved and became attached to them remains a hotly debated mystery. 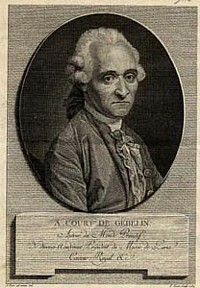 Because it was an oral tradition, few details of how Tarot cards were actually used for fortune telling were written down before the eighteenth century when Antoine Court de Gebelin (1725-84) made a detailed study of them in his comprehensive encyclopaedia of ancient myth and legend Le Monde Primitif. Gebelin advanced the theory that they were of Egyptian origin – a lost ancient book of wisdom no less – that had been brought to Europe by gypsies, who were then supposed to have come from Egypt. So plausible were his arguments that they prevailed for well over a century and it is still popularly believed among Tarot enthusiasts that the pack is no less than the legendary Book of Thoth (the Egyptian equivalent of Hermes and Mercury) as Aleister Crowley later proposed. India has emerged as an equally likely home of Tarot, particularly since it has become clear that India is actually the original home of Romany gypsies. There is good evidence to suggest that card playing in general emerged in India from an ancient set of games back in the fifth century that evolved along different lines into playing cards, Ludo and chess as we know them today. One of these Indian games was Chaturanga, a chess-like game in which four kings, each supported by nobles and pawns, battle for supremacy on a board. 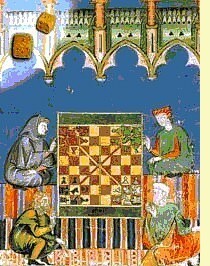 The likely suggestion is that in the absence of a game board and pieces, cards of four suits were used to represent the pieces, the number of cards growing and the pattern of the board becoming increasingly irrelevant as cards developed into a games medium in their own right. In the nineteenth century Eliphas Levi (Alphonse Louis Constant, 1810-75) took a slightly different line, interpreting Tarot in the light of the Jewish mystical tradition of Kabbalah. 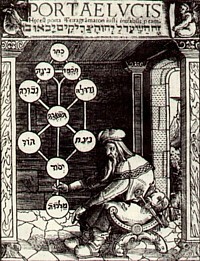 In his classic book The Dogma and Ritual of High Magic, 1861, he related the Major Arcana to the 22 letters of the mystical alphabet attributed to the prophet Enoch and also the 22 paths of the Tree of Life which lies at the heart of Kabbalistic philosophy, leading to his conclusion that: ‘The Tarot, this miraculous book, is the source of inspiration of all the sacred books of the ancient peoples, the most perfect instrument of divination that can be employed with complete confidence because of the analogical precision of its figures and its numbers’. These and a multitude of other mostly forgotten theories have helped shape the Tarot as we know it today and probably there is no real contradiction between any of them. In its long journey from ancient times to the present Tarot has absorbed all the mystical influences it met along the way and it continues to evolve today. Whether it actually originated in India, the Middle East or Europe is beside the point. All mystical traditions tend towards the same fundamental truths that by the very nature of its structure the Tarot is able to represent.